Eugene Korn, resides in Jerusalem. He received semikha from the Israeli Rabbinate (Pirchei Shoshanim) and holds a PhD. in moral philosophy from Columbia University. The founding editor of The Edah Journal, he has contributed previously to Conversations. His books include Jewish Theology and World Religions, Covenant and Hope, Plowshares into Swords: Reflections on Religious Violence, and Returning to Zion. His scholarly essays have been translated into Hebrew, German, Italian and Spanish. A number of years ago I delivered a lecture in an Orthodox synagogue that I carefully titled, “The Ethics of Receiving but not Donating Organs.” Before the presentation a goodly number of interested listeners approached me in protest under the mistaken assumption that I deemed this practice to be moral. Their collective instinctive response to me was, “You must be joking. It is ridiculous to think that this could be ethical.” These people were neither philosophers, nor ethicists, nor experts in any field of abstruse logic, just people with healthy moral instincts. The lecture came on the heels of a study on the halakhic definition of death published by the Rabbinical Council of America in June 2010. The subject is enormously important because it has, quite literally, life and death consequences. The possibility of successfully transplanting hearts and lungs depends upon the transplant taking place prior to cardiac cessation, and thus saving a recipient’s life depends on the removal of the brain-dead donor’s vital organ while his/her heart is still beating aided by artificial means. While not intended as a formal legal ruling (p’saq halakhah), the RCA analysis relied on halakhic authorities who employed technical halakhic reasoning in their arguments. No mere theoretical study, the report was intended to influence practicing Orthodox rabbis whose congregants seek guidance from them regarding the halakhic (im)permissibility of donating and receiving transplanted organs. The RCA study rejected clinically certified brain death as a sufficient condition for halakhic death, leading to the conclusion that extracting a heart of a brain-dead person for the purpose of transplantation constitutes illicit “bloodshed” against the donor. It therefore ruled that a person (or his family) is forbidden to donate such a vital organ. Yet while forbidding donation, the study also concluded that it is permissible to be the recipient of a heart transplant. In other words, it ruled that it is right to benefit from another’s benevolence but wrong to provide that same benefit to others, that one may be a taker from others, but not a giver to others. The audience at the lecture was not alone in their moral judgment: Permitting a person to be a recipient of a vital organ transplant but forbidding him to be a donor (hereafter ‘RBND’) is widely considered a violation of ethical principles by transplant specialists, the broader medical community, philosophers, professional ethicists, the European Network of Organ Sharing, and nearly all people committed to fairness and equality. The RCA study provides a prime example of halakhic reasoning that violates ethical standards and reasoning. There are other halakhot that also seem morally flawed, such as the obligation to return the lost object of a Jew but not of a gentile, the principle of saving a Jewish life on the Sabbath but not a gentile life, the permission to indiscriminately kill civilians in war, and the advocacy of harmful therapy for homosexual persons, to name but some. Should we dismiss the moral qualms of halakhic Jews regarding these halakhot as mere chimeras, or should we better regard this disquiet as real and consider it a call to further religious thinking and action? There is an argument that must be addressed before identifying which values and principles make halakhic arguments moral. Some Jews maintain that halakhah defines correct morality (the strong thesis), while others insist that halakhic decisions by themselves are sufficient grounds for moral correctness (the weaker thesis). According to each of these theses it is impossible for Jewish law and morality to conflict with each other, and one need not consult anything outside of halakhah to ensure an ethical conclusion. For these Jews engaging in such extra-legal inquiry is not merely superfluous, but may even be dangerous and indicative of flagging religious conviction. While these dogmatic positions are popular beliefs among some Orthodox Jews today, in fact they are new ideas in rabbinic thought that are easily disproven by both logical argument as well as rabbinic tradition itself. To my knowledge no Talmudic sage or medieval rabbinic authority maintained either of these positions. To the contrary, we shall see that many were convinced of their opposites. All of us make ethical judgments and use terms like ‘good’ and ‘right’. But what do we mean by these terms? The 20th century British philosopher G.E. Moore devised an elegant proof to show that however we attempt to define ‘good’ by identifying it with any non-moral idea or object, we fail. If we define ‘good’ as some particular natural entity like pleasure or law (for the sake of discussion let’s call it ‘X’), we can always ask the question, “This is X, but is it good?” Even if the answer to the question is ‘yes’, the question remains coherent and “open”, i.e. it is at least possible to conceive of the answer being ‘no’. This is unlike asking, “He is a bachelor, but is he unmarried?” where it is impossible to think that the answer is ‘no’ when we understand what the words mean. The openness of the question about goodness indicates that ‘X’ is not analytically identical with ‘good’. In the halakhic context we can ask, “This action is required by halakhah, but is it morally good? Is it morally right? Is it just?” These questions are non-tautologous and remain open, which indicates that halakhah is not identical with our notions of ‘good’ or ‘right’ and it cannot accurately define moral goodness and ethical rightness. Moreover, people with no knowledge of halakhah or even awareness of the existence of halakhah make moral arguments and form moral judgments. If halakhah indeed defined morality we would never be able to agree or even disagree about ethical issues with these non-halakhic people, for we would be talking about completely different ideas in our discussions with each other. 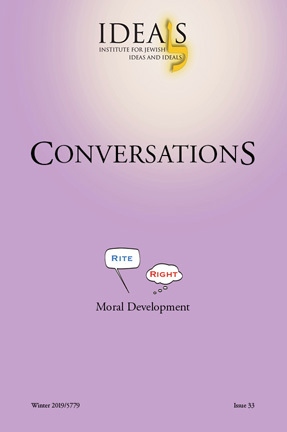 I could not claim that I am correct in believing that abortion is morally wrong and another is incorrect in his belief that abortion is morally right, since we would not at all have in mind the same thing when we use the term ‘moral.’ Yet obviously we do engage in real moral discussion, agreement and disagreement with people who have no idea of halakhah. The Talmudic rabbis understand the destruction of Jerusalem as the divine punishment for the Jewish people’s violation of its sacred covenant with God. According to R. Yohanan, this violation existed at the very same time that Jews were observing formal halakhah impeccably. (“Jews judged according to the law [din] of the Torah.”) Yet God called the Jewish people to account and imposed on them the harshest punishment known in Jewish history. Thus according to R. Yohanan Jews were morally culpable even though they had no legal liability. While there are other talmudic opinions about the cause of the Temple’s destruction, no talmudic opinion challenges the intelligibility of the category of lifnim mishurat ha-din or the conceptual presuppositions of Rabbi Yohanan’s statement, i.e. that the highest Torah standards are beyond the boundaries of strict halakhah. This is impossible if halakhah defines or satisfies all moral requirements. Nor can the concept of lifnim meshurat hadin be understood as formal din without entailing infinite regress and/or incoherence. Shimon ben Shetach was in the flax trade. One day his students said to him, “We will buy you a donkey so you won’t have to work so hard.” They bought a donkey for him from a non-Jewish trader, and it happened that a precious gem was hanging from its neck. R. Shimon said, “And did its owner know (about the gem)?” “No,” they replied. Note that there is no dispute about the halakhic requirements in this case. It is clear that halakhah allows Shimon ben Shetach to keep the jewel. Yet he knew that confining his behavior to the halakhic minimum was morally wrong, that as a moral agent he was required to “go beyond the strict line of the law.” He understood the intrinsic value of doing what was ethically right independent of the halakhic standard. His use of the term ‘barbarian’ is shocking, indicating Rabbi Shimon’s moral outrage—and it is important to note that this outrage stands independent of his motive to bring honor to the God of Israel by dint of his exemplary moral behavior. The Talmudic sages were not the only authorities who understood the difference between halakhic requirements and moral norms; medieval rabbinic authorities did also. Nahmanides claimed that a person can be a “scoundrel within the bounds of Torah law,” and therefore there is an independent religious obligation to “do what is right and good” in our interactions with other people, an obligation that requires us to sometimes desist from what is halakhically permitted. Nahmanides understood that there is conceptual continuity between the mitzvot of being holy and living the ethically good life. And no one less than the greatest halakhic authority in the history of the Jewish people, Maimonides, insisted that hewing exclusively to the letter of the halakhah can produce behavior that is cruel and that befits only “idolators,” not pious Jews. Maimonides stressed that while halakhah points in one direction, good Jews must sometimes behave differently. He never saw halakhah as more than a floor on which to build a more robust Jewish ethic. It is clear, then, that morality, and the ideas of what is good, right and just extend beyond halakhah, even if halakhic behavior and moral behavior frequently overlap. Some halakhic authorities contend that the methods of halakhic argumentation and intrinsic halakhic norms are logically independent from the methods of correct moral reasoning and fundamental ethical concepts. The total independence of halakhic axioms, rules of inference, values and method was stressed by Lithuanian analytic talmudic scholars, and it was best described by the Brisker school of the nineteenth and twentieth centuries, whose leading proponents were Rabbi Hayyim Soloveitchik and his grandson, Rav Joseph B. Soloveitchik. Both fiercely insisted on the autonomy and the internal coherence of halakhic thinking. For them halakhah was a rigorous “closed” logical system: “To whom may he [the halakhic man] be compared? To a mathematician,” proudly announced the grandson Rav Soloveitchik. In the Brisker understanding, halakhah is an ideal system analogous to pure mathematical systems, which represent the archetypes of objective rational inquiry. Halakhah is a science that molds and imposes interpretations on empirical reality, rather than being influenced by it. In other words, ideal halakhah is abstracted from the flux of human experience—the very meaning of the term ‘apriori’, which Rav Soloveitchik was so fond of using when describing halakhah. As an independent and autonomous system, halakhah is value-neutral, similar to mathematics, whose sole methodological guides are consistency, coherence and simplicity. Like differential geometry, it is largely removed from human emotions, sensibilities and desires. And like the autonomous sciences, halakhic logic is amoral—sometimes yielding ethically neutral conclusions (as in ritual law), sometimes yielding conclusions coincident with ethical reasoning, and sometimes yielding rulings contrary to ethical values, rules and judgments. This is why halakhic geniuses can sometimes arrive at rulings like RBND and other morally problematic conclusions. In R. Soloveitchik’s words, “the sole authority [of halakhah] is logic,” and thus some halakhists simply go wherever their value-neutral logic takes them. This is not to imply that R. Soloveitchik himself was deaf to the call of ethical values. He certainly was not. There are two fundamental moral concepts that form the foundation of all sound moral reasoning: justice and compassion. Morally sensitive people display a commitment (even if sometimes unconscious) to these values, and nearly every good ethical judgment is derived from some variation of these concepts. These values are the foundations of our moral sense, and they go to the heart of what we mean by ethics. Certainly we would not consider a person who is indifferent to injustice or one who remains stone-cold to human suffering to be a moral person. Being blind to justice and compassion are the surest indications that such a person is not in our moral universe. Justice and compassion are the natural sensibilities that God implanted in our unique human consciousness to enable us to be ethical beings—and they require no further defense or justification. When Abraham challenges God by asking rhetorically, “Will the Judge of all the earth not act justly?”, both Abraham and the Torah assume that if God is the moral ruler of the universe, God must act according to the standards of justice. When the Torah announces “Justice, justice you shall pursue” (Deut. 16:20), the value of justice itself needs no proof. When Maimonides rails against insensitivity to the hardship and suffering of others, it is self-evident that compassion (hesed) itself is a moral good requiring no further validation. ‘Justice’ here means fairness and impartiality. In a just social system people are not granted unfair advantage over others and those benefiting from the system’s privileges must also accept its duties. Justice expresses itself in the principles, “treat similar people similarly,” and “do not give one person preferential treatment over others in the same situation.” These generalization rules give ethical judgments their objectivity, enable us to reason from one case to another, and they ensure that moral claims are logical principles rather than mere expressions of personal interest. When I say ‘you ought to pay your taxes,” the ‘ought’ signifies an ethical principle if I agree that all people like you—including me—ought to pay their taxes too. If I reject this generalization and claim that you ought to pay your taxes, but although I am just like you I am not obligated to pay my taxes,” my claim is not a moral principle at all, just a subjective preference. The best way to test the objectivity of a moral judgment and the ethical legitimacy any statement I make about your obligations is to reverse our positions: If I don’t accept that I too have that obligation when I am in your shoes, then it is not really moral claim. If I claim that “everyone ought to be kind to me when I am in need, but I have no obligation to be kind to others when they are in need,” no clear thinking person would deem this a legitimate moral position. This generalization test is sometimes referred to as “moral imagination,” since it requires a person to see himself as the other person. Of course this generalization principle and its reasoning appears in the Torah as “Love your peer as yourself,” (Lev. 19:18) as well as in other formulations, but it is not a uniquely Jewish idea. It is not only ‘the great general principle of the Torah,” as Rabbi Akiva claimed (Sifra 2:16:11), but it is also the essential characteristic of justice that is found in the literature, laws and correct reasoning of all moral religions and ethical societies. Compassion is the second foundation of morality. There is enormous difference between analytic intelligence—the ability to see logical connections and make deductive inferences—and emotional intelligence, the capacity to understand the human condition of another and to think about other people as subjects like ourselves, not mere objects of cognitive or halakhic inquiry. Compassion is the feeling of empathy, in which the pain of one person of itself awakens in another. The higher and more human the beings are, the more keenly attuned are they to re-echo the note of suffering. Like a voice from heaven, it penetrates the heart. Compassion is not only the ability to see another person as equal to yourself, but it is to sense—even in a small way—how that person feels, what s/he wants and how s/he wants to be treated. When we apply this moral sense we feel the responsibility to accord others dignity and respect (as we ourselves naturally want to be respected), to avoid causing them emotional and physical pain (as we naturally want to avoid pain), and help others flourish (as we ourselves naturally wish to flourish). In fact both these fundamental elements of justice and compassion are often opposite sides of the same moral coin, and when we employ them correctly they frequently yield the same conclusions: Justice as fairness and impartiality is moral reasoning’s cognitive dimension, while compassion is the emotive component of a healthy moral sense that moves us to treat others the way we wish for others to treat us. This emotive component is critical to both ethical logic and moral motivation, as a strictly cognitive rule dominated approach to ethics, be it philosophical or halakhic, proves sometimes cruel and often impotent. Examining these two root moral concepts reveals why RBND and some other halakhot are morally problematic. Is it fair to take from others, but not give to them? Is it just to return the lost articles of other Jews, but not of gentiles—as the simple halakhah allows? Is it compassionate to intentionally kill helpless infants and infirmed elderly people who pose no direct threat during war—as the commandments to wipe out Amalek and the Canaanite nations require and the halakhic guidelines of milkhemot mitzvah (obligatory wars) allow? Can these latter halakhot really be moral and just, particularly when we correctly judge the intentional killing of innocent civilian Jews by Palestinian terrorists to be abhorrent? Heart transplants create an ethical symmetry between donor and recipient, and a unique one-to-one causal relationship between them. Because of this relationship, if it is wrong for me to donate my heart because I contend it is murder, it must also be wrong for to me to be a recipient because in receiving another’s heart I am an agent in that donor’s murder. And if it is permissible for me to receive the transplanted heart, then it must be permissible for me to donate my heart to a recipient. Justice rules out the morally untenable position of me having a privileged status over others by receiving someone else’s heart when the other person could not receive my heart due to my refusal to donate. Because the values of fairness and impartiality are fundamental to our moral thinking, if we assume that heart transplants constitute possible murder, there is no legal technicality or casuistic distinction within halakhah that can succeed in justifying permitting a person to receive an organ while he refuses on principle to donate. If I am alive as a potential donor when I am brain-dead then another brain dead person is equally alive when I need his heart, and it is immoral for me to play a role in his death by participating in the removal of his heart. Such action violates the moral consistency and reversibility tests, asserting that transplants are wrong when I am a donor and another is the recipient, but right when I am a recipient and another is the donor. As such, RBND reasoning is morally illogical and ethically unprincipled, and acting on it is morally wrong. As we will soon see, many rabbinic authorities have noticed that this moral logic is at play regarding returning lost objects. Shimon ben Shetach realized that it is unethical—to the point of barbarism—to expect others to return my lost object, yet not be under any obligation to return the lost objects of others. This is logically akin to demanding that others pay their taxes so I benefit from state services, but permitting myself to evade the corresponding obligation to pay my own taxes. Halakhic authorities also employed comparable moral reasoning in interpreting other morally problematic halakhot. Of course both justice and compassion are not extrinsic to Judaism and rabbinic writing. To the contrary, they cut to the core of proper Jewish life and the ideal religious Jewish personality, as the previous citations of R. Yohanan, Shimon ben Shetach, Maimonides and Nahmanides insist. The Torah implores Jews to strive after these generic values in Deut. 6:18. Yet they appear prominently in other explicit and implicit forms as well as in other derivative ethical concepts contained in the Torah and in rabbinic writings. …You shall decide justly between an (Israelite) man and his fellow Israelite and between an Israelite and a stranger. You shall not take note of the individual in judgment; (rather) you shall hear a small person the same as you do a great person. Judges and officers shall you appoint in all your gates, which the Lord your God gives you, throughout your tribes; and they shall judge the people with just judgment. You shall not pervert judgment; you shall not take note of persons, nor take a bribe; for a bribe blinds the eyes of the wise, and perverts the words of the righteous. Justice, justice shall you pursue, that you may live, and inherit the land which the Lord your God gives you. Although these imperatives appear in a judicial context, the value of justice for general Jewish behavior is undeniable. Note here the focus on fairness in administering justice, i.e. treating everyone equally and prohibiting favoring one person over another. Justice as equality and fairness is also an implicit value underlying Lev. 19:18: “You shall love your peer as yourself: I am the Lord.” According to Abraham Ibn Ezra, this equality applies to every human person because all persons are created the same way by God. Hillel’s talmudic negative formulation of this verse has as its thrust the moral reversibility test for correct Jewish behavior, i.e. “if you do not want others to do a specific act toward you, you ought not to do it towards others”. Hillel’s standard is nothing other than a precise reformulation of the generalization principle of moral reasoning. As Ibn Ezra understood, justice and the Jewish moral imperative to act with justice flow directly from two central axioms of Jewish theology: Firstly that all persons are created in the Image of God (Tselem Elokim), and derivatively that human beings are capable—nay obligated—to imitate the Divine (Imitatio Dei). Because God is exalted, dignified and worthy of respect, so too all persons endowed with the Divine Image are owed intrinsic dignity and respect. As R. Joseph Soloveitchik incisively observed, respect for every human being (‘kavod ha-beriyot’) is merely the rabbinic expression of the Bible’s concept of ‘Tselem Elokim’. Just as the Divine possesses intrinsic sanctity, so too must we treat His children as creatures with intrinsic value, not to be used solely as a means to our own ends or exploited for utilitarian purposes. As such, Tselem Elokim is the theological version of the basic principle of rational humanistic ethics. Justice as fairness also underlies the talmudic statement, “The entire Torah is for the sake of peace.” (BT, Gittin 59b). Peace, i.e. social order, stability, diminution of strife, is a substantive value that every person pursues for himself. If so, he has a moral obligation to promote it in the lives of all others. The same logic obtains regarding the Torah value of “darkhei noam”—ways of pleasantness. If one wishes to pursue a pleasant life in which he can flourish, the logic of justice implies that one must extend that opportunity to others and allow them to flourish. The power of giving is a Divine power, one of the traits of the Creator of all things, may He be blessed, Who shows compassion, is beneficent and gives, without receiving anything in exchange… In this way, God made man, as it is written: ‘God made humankind in His own image,’ so that humans would be able to show compassion, be beneficent and give. [The Torah] added this reason: for you know what it feels like to be a stranger, because you were strangers in the land of Egypt. That is to say, you know that every stranger feels depressed, and is always sighing and crying, and his eyes are always directed towards G-d, therefore He will have mercy upon him even as He showed mercy to you. Shmuel’s father insisted that his son rule with compassion and brings home his point with the stinging rhetorical question demanding that Shmuel put himself in the position of the captives’ father, i.e. to identify with the captive women, to empathize with their distress and to treat them as human subjects as would their fathers and mothers, not as mere halakhic objects. In other words, just as God is moral by virtue of the divine attributes of justice and compassion, so we too must be moral by acting with tsedek (justice) and hesed (compassion). Finally it is important to note that R. Akiva’s “great principle of the Torah,”Ve-ahavtah l’re’akhah kimokhah,” is a fusion of the generalizing principle of justice (kimokhah) with the necessity of feeling toward the other (“ve-ahavtah”). This principle, then, is the religious formulation of the ground of good ethical reasoning and behavior. Classic rabbinic thinking utilized moral argumentation in determining halakhah. The Talmudic sages determined the operative interpretation of lex talionis (“an eye for and eye”) based on a moral argument from retributive justice: “one person’s eye may not be equal to another person’s eye” and thus they ruled that these verses should be implemented via fair monetary compensation rather than literally. Halakhic tradition similarly interpreted the Biblical laws regarding the idolatrous city (ir ha-nidachat) and the rebellious son (ben sorer u’moreh) to be only theoretical because of the unjust and overly harsh punishments that literal implementation would entail. Despite this powerful ethical thrust in biblical, Talmudic and rabbinic traditions, there remain halakhic rulings that are in deep in tension with ethical standards. Aside from the RBND ruling that violates moral consistency and just standards, the halakhic obligation to return the lost article of a Jew, but not of a gentile is another problematic case. This distinction appears to constitute unjust discrimination, as does the distinction between putting the life of a Jew ahead of Shabbat observance but not doing so for gentile life. Halakhists have been troubled by these halakhic claims and sought to interpret them in ways that are consistent with justice and compassion, i.e. render them ethically correct. Examining these approaches can prove instructive for shaping halakhah in line with moral standards. A large number of Orthodox rabbis have rejected RBND in the name of halakhah. Many announced early on that this position is ethically untenable due to its lack of moral consistency. In addition, the Halakhic Organ Donor Society (HODS) lists over 300 Orthodox rabbis who accept brain death as halakhic death, thus disagreeing with both RBND and the RCA report. (Interestingly, many of the HODS signatories belong to the RCA.) In Israel the Chief Rabbinate accepts clinically certified brain death as halakhic death and thus also rejects RBND. Rabbis Menachem Meiri, Moshe Isserless (Ramo), Isser Zalmon Meltzer and others interpreted the halakhah of returning lost objects to conform with moral standards by confining the dispensation to not return gentile objects only to gentiles who are immoral pagans who have no respect for property and hence would not return lost objects to other people. In their understanding of Jewish law, when gentiles feel obligated to return lost objects to Jews, Jews are under the obligation to return lost objects to them. In other words, their interpretations reinforce justice and equality based on reciprocity. There is no value to such people [those who violate the basic laws of civility]. They destroy the world, imperil society and destroy both civilization and the establishment of governments. Certainly they are not fit to be considered as inhabitants of civilization and thus subject to a legal order. Therefore they have no monetary rights. In contrast, those who observe the seven Noahide commandments— and they are the majority of people today and all enlightened nations—there is no doubt whatsoever that they are treated like Israelites [with respect to this law of returning lost objects]. In my judgment this true and logical. Note R. Epstein’s last word: “In my judgment this is true and logical.” The truth referred to is his correct ethical conclusion, and the logic to which he referred is valid moral reasoning based on justice as fairness. He has internalized the moral universe built around these moral values, and hence it is self-evident for him that halakhah must be interpreted this way. More generally, R. Menachem Meiri argued extensively in his commentary on the Talmud that all civil halakhic discriminations with respect to rights and responsibilities of gentiles apply only to those gentiles categorized as “not having religion”, i.e. those who were immoral uncivilized idolators. In doing so, Meiri was successful in interpreting the halakhot governing Jewish-gentile relations as reflecting just and fair standards, where justice means the elimination of arbitrary inequalities. One of the critical distinctions between halakhic treatment of a Jew and a gentile is the question of whether one may desecrate the Sabbath to save someone in danger of dying. The Talmud and normative halakhic tradition ruled that saving the life of a Jew takes precedence over a particular instance of Sabbath observance, whereas saving a gentile life does not take precedence over a Jew’s Sabbath observance. Thus there is a clear axiological distinction between Jewish life and gentile life. Rabbinic tradition does grant a Jew the dispensation to violate the Sabbath to save a gentile’s life in order to prevent gentile hatred (“mishum aivah”) and the retaliation against Jews that such hatred might engender. This dispensation, however, is prudential and based on self-interest, not on moral principle, justice, compassion or the intrinsic value of gentile life derived from Divine Image. The disparity between the justifications to save a Jew’s life on the Sabbath and saving a gentile’s life is, at best, morally problematic. We today have no choice but to act in accordance with the principal of equality, considering all persons fully equal even to the point that the Sabbath may be set aside when they face mortal danger, “because of the ways of peace and as a sort of danger to all!” We Jews in particular have tasted the cruel reality of that danger in almost every generation… When they rose up to destroy us, we stood against them in the dark of night, defending ourselves and crying out: “Are we not your brothers, not the sons of the same father or the same mother—how have we differed from every other nation that you persecute us harshly?” But we were not answered, and nothing was of use. So we cannot believe that the law of the Torah requires us, in our present situation, to abandon any person’s life, even to preserve the sanctity of the Sabbath. Note how R. Rosenthal engaged in ethical reasoning by employing Hillel’s principle and moral logic’s reversibility test: We Jews know how unethical it was for gentiles to refrain from saving us, therefore we are obligated not to commit the same wrong by failing to save them. The contemporary halakhic authority, R. Nahum Rabinovitch, also contends that the Torah itself makes no distinction whatsoever between the obligation to save a Jewish life on the Sabbath and saving the life of any civilized gentile (ger toshav). He posited that this was Nahmanides’ understanding of the halakhic imperative in Lev. 25:35: "If your brother falls low and cannot maintain himself with you, you shall uphold him; though be he a stranger (ger) or a resident (toshav) he shall live with you." Like R. Rosenthal, R. Rabinovitch understands the Torah to naturally reflect the ethical principle of treating human life equally, which must be honored in the era of universal human rights of all non-threatening civilized persons. This is expressed religiously as the intrinsic sanctity and dignity of all human life derived from the universal endowment of Tselem Elokim. As such, the distinction between saving a Jewish life and a gentile life on Shabbat cannot be made consistent with the basic assumptions of equality and intrinsic dignity of each human life. The moral illegitimacy and logical inconsistency of this position is clear. Jews (and all right thinking people) properly condemn as immoral terrorists who attack, kill and maim Israeli civilians. If the unacceptability of intentional attacks on civilians is a moral principle, then it must be so generally: Both when Palestinians attack Jewish non-combatants, as well as when Israelis (whether in or out of uniform) attack Palestinian non-combatants. Moral consistency demands that if we condemn the former, we must also condemn the latter. Permitting the latter puts Jewish fighters on the same immoral level as cruel terrorists who brutally murder Israeli teens innocently eating pizza in Jerusalem, Jews piously celebrating a Seder in Netanya and Israeli infants riding quietly in their parents’ car. Of course, permitting the targeting of non-threatening enemy civilians also blatantly violates the second moral value of compassion. Intentionally killing a Palestinian infant or a non-threatening infirmed grandmother is the very opposite of exercising compassion. It can be done only by rejecting empathy, legitimizing cruelty and considering these targets impersonal objects rather than human subjects. There is one more example of a morally problematic halakhic thinking that bears analysis. As mentioned earlier, there is considerable rabbinic advocacy for reparative (change) therapy for homosexual persons, no doubt in order to strengthen support for the biblical prohibition against homosexual relations (Lev 18:22). This advocacy persists even while the American Medical Association, the American Psychological Association, the American Psychiatric Association, other professional medical organizations and numerous government bodies have concluded that there is no credible evidence indicating that change therapy is effective and, worse still, that this therapy is likely to cause physical and psychological damage to the patient. This is also the consensus opinion of medical professionals in Europe and Israel. Because of change therapy’s harmful effects a growing number of states and municipalities in America have banned this therapy for minors. Yet the rabbinic advocacy of change therapy continues to stand in the face of this evidence and professional consensus. It may well be the rabbis who signed this declaration are not sufficiently informed or convinced of the non-efficacy and harmful effects of change therapy, in which case their advocacy does not indicate any lack of compassion or empathy for gay and lesbian persons. However in light of the mounting public evidence regarding change therapy, it is irresponsible to advocate this course of treatment. Let us assume that the consensus of medical professionals is correct and that change therapy is both ineffective and harmful. Given these data, would the rabbinic signatories of the declaration prescribe such therapy to their own sons and daughters, as they are doing to others? To paraphrase the father of Shmuel in Ketubot 23a, “If they were your sons and daughters, would you treat them this way?” Yet this is what the generalization and reversibility rules of ethics demands if such a policy is to be moral. Are the signatories fulfilling the biblical imperative to “love your peer like yourself?” According to the medical consensus change therapy is the equivalent of a drug rejected by the FDA because clinical trials failed to satisfy standard efficacy and safety requirements. Would the declaration’s signatories give their loved ones such a drug, particularly when they know that these loved ones have increased incidents of drug use, depression, suicide ideation and suicide attempts, as do homosexuals? Can their advocacy of this doubtful therapy be accurately described in any way as evincing compassion or empathy? Halakhic Jews have a moral responsibility to protect the welfare and equality of all non-threatening persons. Correct ethics require that LGBQT persons be treated by others as full human beings to be understood and treated with compassion, not as problems to be solved. In addition to rejecting scientific judgment, the continued rabbinic advocacy of conversion therapy neglects the welfare of individual homosexuals for the purpose of sustaining a traditional ideology. This is neither just, nor compassionate, nor ethically justifiable. Similar to the other cases, there are halakhic alternatives to this approach, reflected in different statements by rabbis and religious educators regarding policies toward LGBTQ persons. These do not advocate harmful policies, but stress the moral and religious obligations to demonstrate compassion and understanding toward gay, lesbian and gender fluid persons, similar to all other persons. These approaches recommend non-discriminatory policies toward all persons with homosexual orientation and the religious obligation to treat them in their full humanity—all without violating the biblical proscription against homosexual relations. There is no doubt that ethical thinking based around the concepts of justice and compassion have a universalizing tendency, and this universalism is sometimes in tension with traditional halakhah. It also chafes against the current Orthodox tendencies toward inwardness and parochialism. The most severe ethical challenges to halakhah for today and the future require us to think anew about how to justly treat and promote the full humanity of women, heterodox, secular and LGBTQ Jews as well as gentiles—i.e., persons other than the adult religious Jewish males who have traditionally dominated halakhic discourse and Jewish leadership. The ongoing project of Jewish ethics entails the continuous expansion of the spheres of justice and compassion to include all human beings. Nor is this progressive growth in our moral awareness inimical to the eternal nature of Torah. Rather, it should be seen as essential to God’s plan for the Torah to apply over all different cultures and the entire sweep of human history. The concept of Tselem Elokim is a rich source for sound ethical reasoning built on justice and compassion. The Torah teaches that all human beings are endowed with this transcendent quality, and hence the ethics flowing from Tselem Elokim dictate that we widen our scope of sensitivity and ethical concern toward all human beings, striving to treat each not merely as a means to another end, but as a subject who has emotions, anxieties, interests and needs like ours and who has a unique voice worth hearing, just as we wish to be treated, understood and heard. The endowment of the Divine Image also implies that we must understand that a person’s value, dignity and right to equality reside in his/her personhood, not in his/her gender, theological orientation or ethnic identity. This requires a conceptual shift from the classical halakhic categorization of people as members of a group to evaluating and relating to each as an autonomous individual. This outlook is closely linked to R. Akiva’s great principle of the Torah in Lev 19:18 and to achieve highest levels of morality we must interpret ve’ahavtah l’re’akhah kimokhah to require the full consideration of all non-threatening human beings, as did Avraham Ibn Ezra. Rabbi Uziel insisted that women have the right to vote and to hold public office because he understood that treating people as creatures endowed with Tselem Elokim entails granting them full human dignity, including the right to speak for themselves and to defend their own interests. Ovadia Seforno also understood Tselem Elokim to mean that people must be allowed to be free to make their own choices, and therefore each adult has the right to a voice in decisions effecting him or her. As such, Tselem Elokim foreshadows the principle of justice and requires that we give all Jews including women, heterodox, secular and those with different sexual orientations the right to speak for themselves in communal decisions and policies effecting their interests. To exclude them and presume to speak for them, however well-meaning the intent, is a paternalism that does not square with the demands of fairness and human dignity. In halakhic language, it is a violation of kevod ha-beriyot. This is a particularly vexing moral problem today in Orthodox rabbinic decisions regarding women, who continue to be excluded from decision-making processes about women’s rights as well as communal policies and norms. The logic of justice and compassion dictates that we not marginalize women in voice or decision. And when deciding Jewish policies effecting gentiles, correct ethics demand that we consider them full human beings equal to Jews in both value and rights. Halakhah cannot and should not be reduced to ethics alone. Surely there exist other desiderata with valence in the halakhic system, and for halakhah to maintain its identity and structural integrity, the justice, compassion and the human sensitivity demanded by Tselem Elokim cannot be the only values operative in halakhic reasoning. Yet if halakhah is to retain moral integrity, it must function within the bounds of tsedek and hesed. Not long ago I discussed the military ethics of Israel Defense Forces with someone who helped write the IDF's code of military engagement. I asked him why the IDF insists on following just war principles even when they entail significant risk to Israeli soldiers, make battlefield decisions more difficult and are costly in blood and treasure. He answered that morality is essential to Jewish identity. It is who we are and who we should be. He then added a more prosaic reason: Israeli soldiers must believe in the justice and rightness of their cause. They must be able to look at themselves in the mirror and know that their sacrifices are for a noble purpose. IDF officials realize that if their soldiers lose conviction in the justice of their cause and the moral integrity of their battlefield behavior, they will not be willing to risk their lives. Many, in fact, will not return to serve when called upon. It is these ethical values that sustain the high morale of the Israeli army. And so it is with halakhah. Should Jewish law lose its ethical moorings, it will devolve into just another set of laws holding no more attraction than any other legal system. As a consequence halakhah will cease to be a rallying point for many Jews, at which point they will deem halakhah inferior to more just systems, lose their conviction in it and renounce their halakhic commitment. Only when halakhah manifests a deep passion for justice and human sensitivity will it secure the allegiance of Jews today. Moral integrity is, therefore, an existential imperative for contemporary halakhah. No doubt a small number of Jews will choose to disregard moral logic, broader human wisdom, and anything not technical and parochial. As one radical halakhic decisor claimed: “The morality of gentile nations cannot understand the essence of Judaism. Therefore gentiles have nothing to teach us.” No wonder, then, that this poseq permits intentionally killing civilians. It fallacious to interpret this kind of insular thinking with its dismissal of ethics as authentic to Jewish law or spirit. On the contrary, dismissing ethics in determining formal halakhah represents a severe defect in their understanding of Torah, of which justice and compassion are intrinsic elements. At the dawn of God’s covenant with the Jewish people, God challenged Abraham and his descendants "to act with compassionate righteousness and justice" as the signal characteristics of their covenantal commitment. Moses later commanded the Jewish people to "do what is right and good,” and later still Isaiah challenged the Jewish people in God's name to be "a light for the nations." Thus the ethics of justice and compassion have always been intrinsic Jewish values and essential to the sacred Jewish covenantal mission. Contrary to the contemporary rabbinic opinion just cited, the Torah insists that when Jews observe God’s commands correctly, the nations of the world will not be at a loss for understanding. On the contrary, they will conclude about the Jewish people, “Surely this is a wise and discerning people.” (Deut. 4:6). The Bible proclaims that Jewish ethics is no esoteric enterprise; rather it is one whose values all people will appreciate when Jews observe Torah correctly. Justice and compassion are fundamental to Jewish religious life, but they are also universal. And so Hebrew Scriptures promise that when Jews live properly their behavior will be exemplary, their wisdom will be understood and their values will be recognized by all God’s creatures. This is true not merely theologically, but also empirically: Nothing falsifies claims to religious truth in human hearts and minds as do unjust and immoral behavior. As Maimonides understood almost 800 years ago, Jews who defy moral logic will cause Jews to be seen only as “a foolish and despicable people,” rather than a wise and discerning one. Nor is this commonality with general human ethical judgment a threat to the unique nature of Jewish religious commitment. The Torah challenges the Jewish people to be a kingdom of priests and a holy people, and when all Jews are priests it can only be gentiles who Jews are bidden to bless, influence and teach. And as Nahmanides understood, our status as a holy people is dependent on our doing what is morally right and good. That holiness is analytically tied to the right and the good, and that there can be no holiness without an abiding commitment to ethics may be two of the most important teachings in the entire Torah. Eugene Korn, resides in Jerusalem. He received semikhah from the Israeli Rabbinate (Pirchei Shoshanim) and holds a PhD. in moral philosophy from Columbia University. The founding editor of The Edah Journal, he has contributed previously to Conversations. His books include Jewish Theology and World Religions, Covenant and Hope, Plowshares into Swords: Reflections on Religious Violence, and Returning to Zion. His scholarly essays have been translated into Hebrew, German, Italian and Spanish. *The author thanks Rabbis Shubert Spero and Anthony Knopf, and Professors David Shatz and Aviva Freedman for their helpful suggestions to this paper. In Israel the prominent halakhic authority Rabbi Shlomo Zalman Auerbach also ruled in 1993 that a Jew may receive but not donate a heart in the diaspora. See Minhat Shlomo, II, section 86, letter of 17 Adar 5753. The formal analysis demonstrating how RBND contravenes ethical principles and reasoning can be found in my “Receiving but not Donating Organs: Ethical and Jewish Considerations,” in Halakhic Realities: Collected Essays on Organ Donation (Magid, Jerusalem 2017). See A. Sagi, “The Punishment of Amalek in Jewish Tradition: Coping with the Moral Problem,” Harvard Theological Review 87:3 (1994) 323-346, and A. Sagi and D. Statman, “Dependency of Ethics on Religion in Jewish Tradition,” Between Religion and Ethics, (Hebrew) (Ramat Gan, Israel: Bar Ilan University, 1993) 116-144, translated as “Divine Command Morality and the Jewish Tradition” in Journal of Religious Ethics 23 (1995): 49-68. The authors contend that stronger thesis appears explicitly for the first time in rabbinic material only in the writings of R. Kalonymus Shapiro, who lived through the Holocaust. This late break with Jewish tradition suggests the possibility of some conceptual assimilation with Christian and Moslem theology, or as Sagi and Statman put it, the thesis “is a foreign shoot that cannot grow in the vineyard of Israel.” (140). Abraham’s challenged God with a similar question: “Will the judge of all the Earth not act justly?” (Gen. 18:25) Clearly Abraham’s convictions about justice transcended what God then commanded. Commentary on Lev. 19:2 and Deut. 6:18, which form one continuous unit. Among other medieval rabbinic thinkers who recognized that halakhic norms do not exhaust moral obligations are Baḥya ibn Paquda (Duties of the Heart, Introduction) and Menachem Me’iri (Beit HaBehirah, to BT Shabbat 105b). R. Aharon Lichtenstein, “Does Jewish Tradition Recognize an Ethic Independent of Halakha,” in Contemporary Jewish Ethics, Menachem Marc Kellner, ed., (Sanhedrin Press, 1978) p. 107. Among other modern authorities who also explicitly affirmed this position are R. Samson Raphael Hirsch (Commentaries to Leviticus 18:4 and Deuteronomy 6:18, and Horeb, paragraphs 219 and 325), Rabbi Shmuel Glasner (Dor Revi’i, Introduction), R. Avraham Yitzḥak Hakohen Kook (Orot Ha-kodesh, 3:318,; Iggerot Re’iyah, Vol 1, letter 89) and R. Yehuda Amital (Jewish Values in a Changing World, Ch. 2, and Commitment and Complexity: Jewish Wisdom in an Age of Upheaval, p. 48). I thank R. Anthony Knopf for pointing out these rabbinic references. See his “Moral Intuition and Jewish Ethics,” Hakirah Vol. 23, Fall 2017, pp.197-222 for further discussion on the topic. Halakhic Man, trans. by Lawrence Kaplan (JPS, 1983) section VI, pp.19-23. Also, R. Soloveitchik wrote “R. Hayyim fought a war for of independence on behalf of halakhic reason and demanded for it complete autonomy…R. Hayyim provided for the halakhah specific methodological tools, created a complex of halakhic categories and an order of apriori premises through a process of pure postulatization.” “Mah Dodeich Midod” in B’sod Hayachid Vehayachad (Heb.) Pinchas Peli, ed. (Orot, Jerusalem), p. 224. Elsewhere, “Not only halakhot but also the chazakot [legal presumptions] [that Hazal] introduced are indestructible…[Even] the chazakot are based on permanent ontological principles rooted in the very depths of the metaphysical human personality, which is as changeless as the heavens above.” “Surrendering to the Almighty,” address to the RCA, November, 1998. From There You Shall Seek (U’bikashtem Mi-sham”), beginning Ch. 15. See Abraham’s Journey, for R. Soloveitchik’s understanding of the Abraham as the archetypical yet pre-halakhic Jew: “Avraham was the model Jew because he substituted the ethical life for the immoral one” and “possessed an ethical system to be carried out and implemented.” In that work R. Soloveitchik also claimed that the experience of slavery in Egypt was necessary to create a hesed people of the emerging Jewish nation. His commitment to ethical integrity also moved him to demand that the Israeli government investigate the role the Israel Defense Forces in the Sabra and Shatila massacres in 1982. Rav Soloveitchik called the National Religious Party officials and told them that he could not continue as President of the Religious Zionist of America if the National Religious Party did not vote in favor of the investigation. Given Rav Soloveitchik's statements on the importance of elemental fairness, justice and ethical integrity, it is inconceivable that he would have agreed with the cited unethical halakhic positions. (See notes 44 and 45.) Nevertheless some of his prominent students have led in advocating these positions because the Brisker formalist theory of halakhah as a value-neutral apodictic system to which they were exposed sometimes conduces to unethical conclusions in practice when not tempered by considerations of justice and hesed. This is elegantly and cogently explained by Yitzchok Block in “G-d and Morality”, presented at the Third Miami Conference on Torah and Science, December 15, 1999, and published in B’Or Ha’Torah, Vol. 12 (Shamir 2006) pp. 129-136. The philosopher Isaiah Berlin claimed that if you meet someone who doesn’t recognize the difference between sticking a pin into a cushion and putting a knife into a person’s stomach, you should cease ethical conversation with him, since that person lacks all empathy and does not share your moral universe. For a full analysis of prescriptivity and how this generalization principle works in moral reasoning, see R.M. Hare, Freedom and Reason (New York: Oxford University Press, 1965). Maimonides defines hesed as ‘haflagah’ (excess or overflow)—i.e., the extension of one substance into another. Guide of the Perplexed, III:53. Jonathan Haidt (The Righteous Mind, (New York: Random House, 2012)) has demonstrated the weaknesses and failures of strictly rational ethics. In the end justice and compassion need to exercise a dialectical balance on each other to create a temperate and healthy ethical system. This is unlike organs stored in an organ bank for future use by an unidentified recipient at the time of donation. For a detailed analysis of this causal relationship, see Korn, op. cit. Yimei Zikhron (Jerusalem, World Zionist Organization) pp. 9-11. The most concise formulation of the foundational principle of ethical reasoning is Kant’s Categorical Imperative, as cited in note 18. These values are so important to Jewish religious life that Maimonides chose to end his magisterial oeuvre, The Guide of the Perplexed, with Jeremiah’s plea and exaltation of these ethical values in Jewish life. Once more, Maimonides’ message to us here is that justice, righteousness and hesed are the essence of proper religious behavior. In accordance with the requirements of retributive justice, numerous rabbinic interpretations of the biblical imperative insisted on judging each person in an idolatrous city individually, rather than the literal collective killing of all residents. R. Meir Afulafiah (Rama) argued strenuously on moral grounds against such literal implementation of killing innocent children of the city, exclaiming, “Heaven forbid that God cause such evil.” For full discussion of the rabbinic deliberations on the topic, see M. Halbertal, Interpretative Revolutions in the Making, (Hebrew), ch. 6, (Jerusalem: Magnes, 1997). “To adopt a restrictive position regarding donating organs and a permissive position regarding receiving organs is morally untenable," found at http://organdonationstatement.blogspot.com. I am a signatory to this statement, as well as a member of HODS. For HODS, see https://hods.org/about-hods/orthodox-rabbis. For a thorough analysis of this position and the rabbinical authorities subscribing to it, see Michael Broyde, “Access to Justice in Jewish Financial Law” in Radical Responsibility: Celebrating the Thought of Chief Rabbi Lord Jonathan Sacks,” Michael Harris, Daniel Rynhold, Tamar Wright, eds. (Jerusalem and New Milford, CT.: 2012) pp. 111-123. Commentary on the Torah (Torah Temimah) on Deut. 22, note 22. See Meiri’s commentary on BT Talmud, Beit ha-Behirah, Yoma 84a, Sanhedrin 57b, and Bava Kama 37b &113b. For explication of Meiri’s halakhic position on these cases, see Moshe Halbertal, “Ones Possessed of Religion: Religious Tolerance in the Teachings of the Meiri” The Edah Journal 1:1, Marheshvan 5761 at http://edah.org/backend/JournalArticle/halbertal.pdf. See Benjamin Lau, “A Reflection of Truth: The Rabbinate and the Academy in the Writings of A. S. Rosenthal on Violating the Sabbath to Save Gentile Life” in Meorot 10, Tevet 5773 found at https://library.yctorah.org/files/2016/07/meorot-10-tevet-5773.pdf. R. Jacob Avigdor argued, “Saving a gentile is not a matter of the Torah’s law or statute; it is a matter of man’s good, human, attributes.” In other words, the obligation stems from natural human characteristics of compassion and fairness. See Lau, op. cit. In Rabbi Rabinovitch’s own words: “In other words, our obligation to save a life is exactly the same for a Ger Toshav as for a Jew and requires that we do everything short of sacrificing our own life to save him.” According to R. Shlomo Riskin, R. Joseph Soloveitchik told him that he believed the imperative to save gentile life on Shabbat is based on this opinion of Ramban. R. Dov Lior, “Jewish Ethics” in Book of Hagi, p. 423 (Heb.). Nor is his psaq without historical precedent, as he and others base themselves on the opinion of Maharal (Gur Ayeh, Gen. 34-13, and Parashat Vayishlach). Mishnah Yada’im 4:4; BT Berakhot 28a and MT, Laws of Kings, 5:4; for prohibition to kill peaceful persons ab initio, see MT, Laws of Kings, 6:1 and 6:4. For R. Goren, see Meshiv Milhamah [Responsa on Matters of the Military, War and Security] (Hebrew) 1983-1992, 1:14. Ibid. See also “Biblical Narratives and the Status of Enemy Civilians in Wartime,” by Yitzchak Blau, Tradition (39:4), 8-28, who also argues against permission to intentionally harm civilians in war. See “Declaration on the Torah Approach to Homosexuality” (2011), found at www.torahdec.org, signed by 223 Orthodox rabbis. The declaration advocates “therapy and teshuvah [repentance],” where it is clear that the therapy referred to aims to change a homosexual’s orientation to “a natural gender identity”. See http://statementofprinciplesnya.blogspot.co.il/; http://www.beithillel.org.il/show.asp?id=71658#.WqTio-huY2w; http://www.tabletmag.com/scroll/192649/watch-orthodox-rabbi-benny-laus-p... and http://www.jpost.com/Jerusalem-Report/Choose-life-412588. This is most explicitly affirmed in R. Nahum Rabinovitch’s “The Way of Torah,” The Edah Journal, 3:1 (Tevet 5763), found at https://library.yctorah.org/journals/edah-journal-marheshvan-5761-11-3. While this shift is typical modern moral and philosophic thinking, Rav Joseph Soloveitchik noted that its source is biblical. He observed that in the account of creation God created all animals in groups “according to their species” (“leminayhu”), i.e. without individuality, while Adam and Eve were created singly qua individuals. Their defining human characteristic is Tselem Elokim, which replaces ‘leminayhu’ in the biblical narrative of the creation of human beings. In other words Tselem Elokim implies considering each person as a unique individual subject, rather than a generic group member. See also his Halakhic Man, pp. 126-130, and Maimonides, Guide of the Perplexed III:18, which stress the value of individuality. Mishna Sanhedrin 4:5 is another pre-modern source emphasizing the religious value of each person’s uniqueness and individuality. The modern rabbinic thinker, Irving Greenberg, cogently points out the theological connections between this Mishna and Tselem Elokim in The Triumph of LIfe: A Narrative Theology of Judaism, ch. 2 (forthcoming), as well as in Living in the Image of God, pp. 31-45 (Jason Aronson, 1998). Classic halakhic literature is replete with cases of men making presumptions about, categorizing and rendering decisions effecting women. In these deliberations, women have no voice to speak for themselves or play a role in the decision-making process. It is difficult to see these processes as just, fairly representing women’s interests or yielding accurate results. Two prominent contemporary examples are the prosecution of divorce proceedings by exclusively male rabbinic courts and the recent discussion and decisions by the Orthodox rabbinate in America regarding the eligibility of women for religious leadership. Can the exclusion of women from both these procedures be consistent with the full humanity and ontological equality of women created in the Divine Image? Can men fairly and accurately represent women’s interests and preferences? R. Yehuda Loewe (Maharal), Netivot Olam, Chapter 5, “Gemilut Hasadim”. Introduction to Mishna, Chapter Helek, pt. 2. Maimonides’ statement is a play on the original Hebrew. Instead of the Bible’s, “am hakham v’navon” (a wise and discerning people), Maimonides used “am sakhal v’naval”—a foolish and despicable people.